This evening we are holding in our hearts our five community members who are spending the night in Central Cell Block awaiting their arraignment tomorrow afternoon. Read our press release about the action and arrests below. Then scroll down for news of our Tuesday evening protest at the White House during Trump’s speech and our community dialogue event earlier in the day. We conclude with an uplifting reflection by Ellen Huffman who is fasting in solidarity with us from Colorado. Thanks, Ellen! Joining them were dozens of protesters who formed a tableau to denounce US-backed war on Yemen and call for closure of Guantanamo. Alongside the banner, 36 children’s bookbags were scattered atop bloodied shrouds. Each backpack bore the name of a Yemeni child killed on August 9, 2019 when a Saudi warplane dropped a Lockheed Martin 500 lb. laser guided bomb on their school bus. 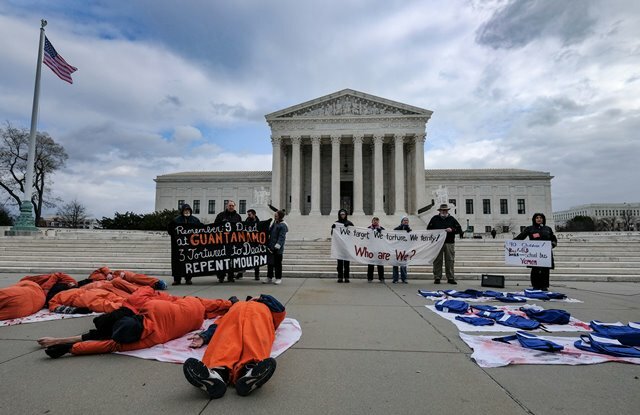 Remembering the nine prisoners who died in Guantanamo, activists clad in jumpsuits and hoods laid down on bloodied shrouds, across from the backpacks. Arrested were Sherrill Hogen, Manijeh Saba, Ellen Graves, JoAnne Lingles, and Charley Bowman. Explaining why she chose to risk arrest, Ellen Graves, a social worker from Western Massachusetts said she is troubled by grotesque practices that have starved, maimed, dismembered and traumatized Yemeni children. 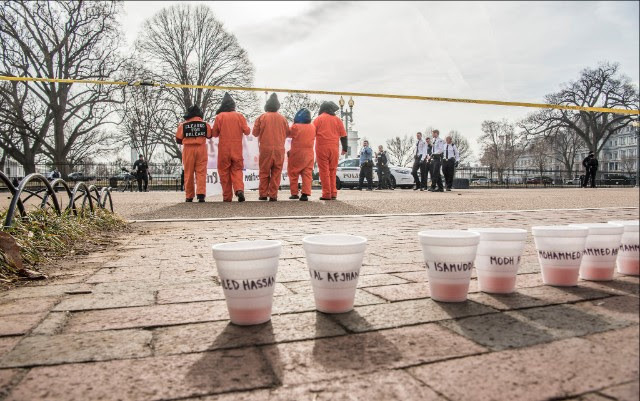 Graves and many of the other activists have gathered for a week of fasting and action that marks January 11, the seventeenth year since Muslim men have been imprisoned in Guantanamo. “The misery of Muslim people continues,” said Dr. Maha Hilal after reading the names of the Yemeni children being commemorated along with the names of nine Muslim men who have died in Guantanamo. 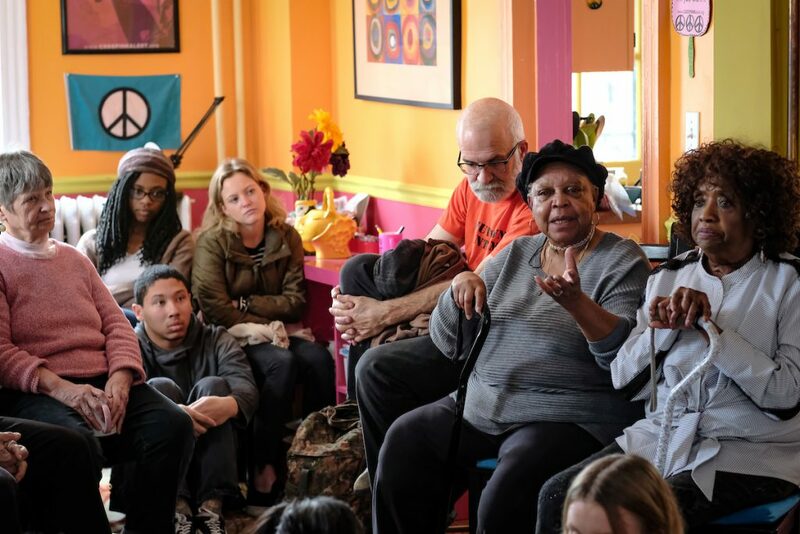 Local tenant justice activists Minnie and Yvonne warmly introduced us to their neighborhood where housing justice is one of the fundamental challenges. We learned that battles they won in the past for holding onto affordable HUD-subsidized housing have returned. As Yvonne described it: first, it was segregation; then it was integration; now it’s gentrification. For her, gentrification is segregation by another name. Minnie & Yvonne were supremely interested in our work in WAT, easily expanding their hearts and their own concerns to us. In fact, they were struck by our WAT t-shirts and so two men gave them their shirts off their backs. They were also delighted to talk with Xavier University students who joined us for the dialogue. They invited us all back in the summer, talking about the wonderful parties, food, and children there are in their neighborhood! 40 men detained at the prison at Guantanamo. Less than ever since its opening in 2002, but still, 40 people. People. Individuals who have been held for years, some cleared for release for years, some never charged with a single crime. 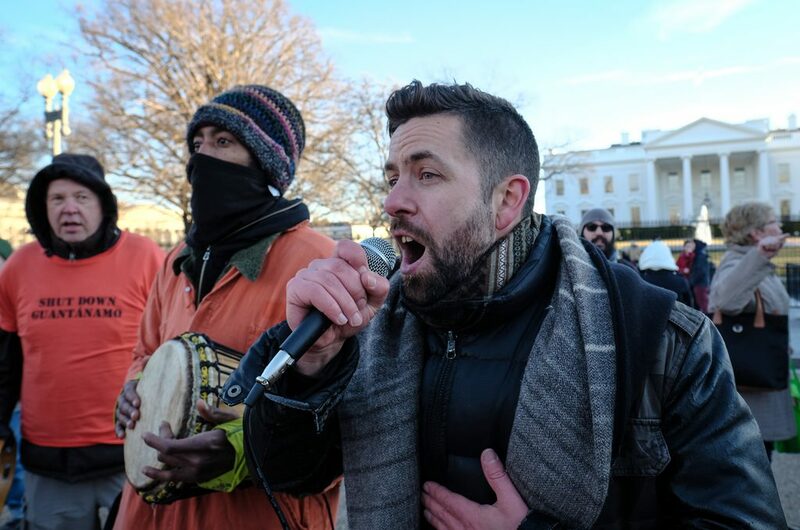 I couldn’t attend the Witness Against Torture (WAT) convergence in Washington, D.C. this year–an experience that was incredibly meaningful to me the three years before–and so I tried to fast in solidarity with those 40 men from my home in Colorado. I knew the stats. I knew the reasons why striving to live in solidarity matters. I knew what it was like to hear the words of Guantánamo prisoners read over a handheld sound system while my stomach folded in on itself. But this time I was alone. This time I could only be connected to the actions of my colleagues through texts and tweets. I’m in a new city where I don’t know too many people and certainly don’t know any other WAT/IRTF folks. I was alone. And I know through my struggles with fasting on my own, with feeling isolated from my community, with feeling lonely and heartbroken, that I was not even skimming the surface of what it might feel like to be separated from family and neighbors, tortured and held for years on end. And I know that ultimately, I was not alone. How could I be? We are made to seek justice in community. We are made to form connections while working for equality and peace. We need each other in this work. It is too hard on our own and we get so much more work done together. I know I treasure my year in Cleveland working with IRTF so much more–and I appreciated it quite a lot while I was there–now that I’m across the country. This work of solidarity matters. You are no less alone than the men I fasted with. Watch your individual actions multiply by partnering with IRTF and WAT. You will be amazed. 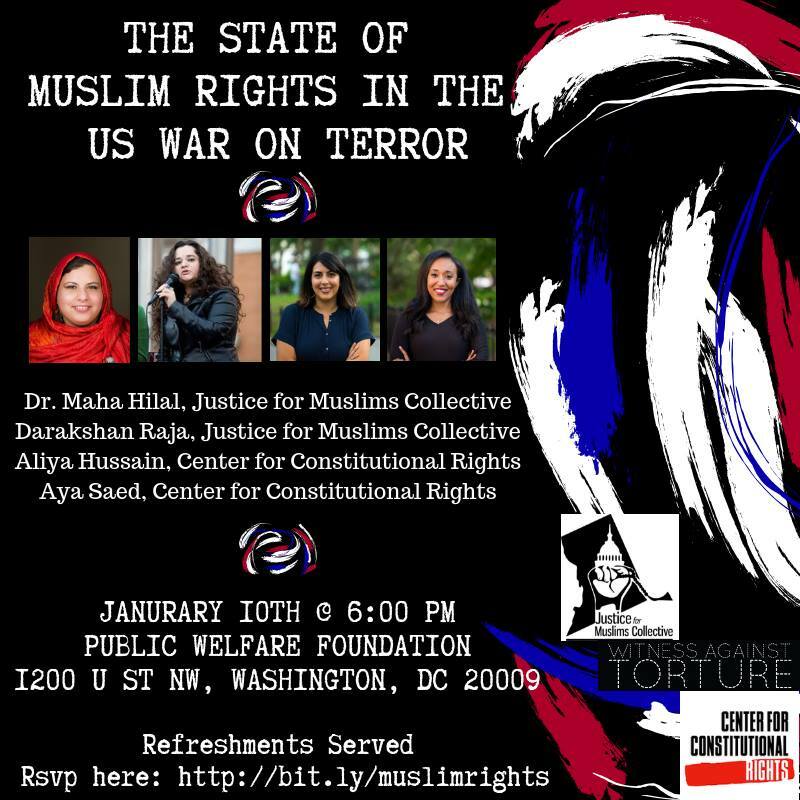 Thursday evening panel, entitled The State of Muslim Rights in the War on Terror. 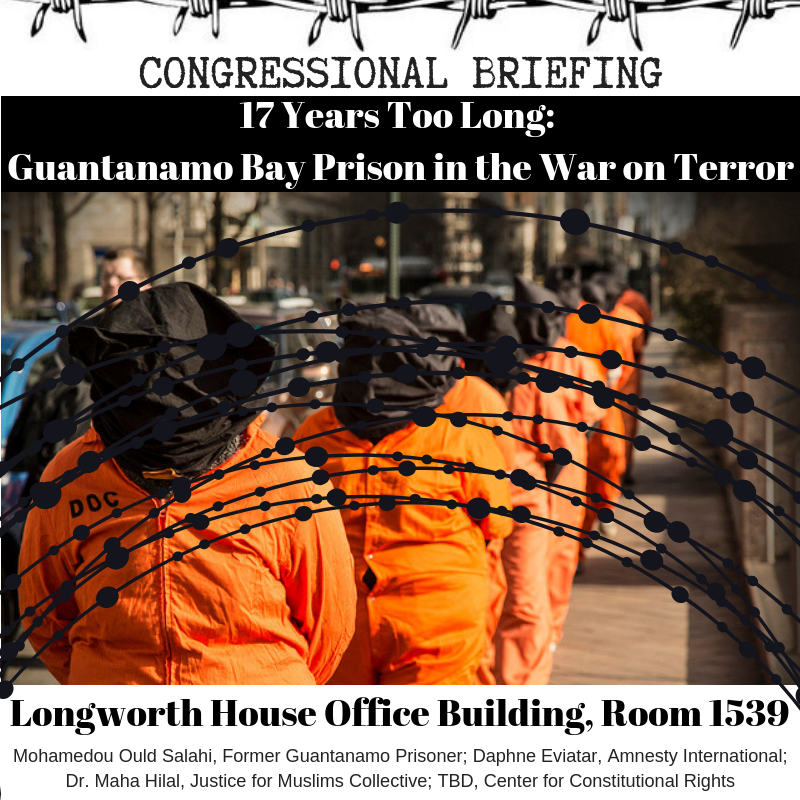 Congressional Briefing on Guantanamo, Friday, 10 am, Longworth House Office Building, Room 1539. 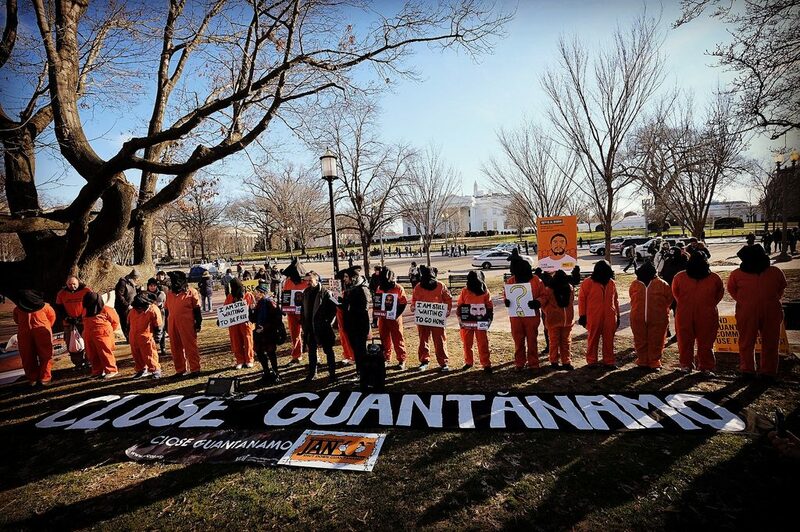 Rally at the White House, marking 17 years of Guantanamo, 2:30 pm. Visit our website for our schedule, photos, and more. A beautiful sunrise back-lit our protest at the Pentagon early Monday morning. O prison darkness, pitch your tent. For after the dark hours of the night, Pride’s dawn will rise. But we know God has a disign. Those who keep knocking shall gain entry. The morning is about to break forth. The 2019 Fast for Justice has begun! The above poem written by Guantanamo detainee Abdulaziz served to frame our first full day in DC on Monday. We read and reflected on the poem during our solidarity fasters conference call in the evening. The final verse, “O crisis intensify! The morning is about to break forth” reminded us of our start to the day: our vigil at the Pentagon, where a beautiful sunrise unfolded behind us and eerily lit up the Pentagon facade we faced. Abdulaziz kept his hope alive in the darkness of his Guantanamo imprisonment, imagining the new light of dawn in the midst of crisis. We feel the responsibility to foster that hope on the streets of DC and in the communities of our readers who accompany us from home. Below please read more from Paulette and Art about the Pentagon vigil. Borrowing from the words of Clare Grady, a Kings Bay Plowshares activist who was on our conference call in the evening: Let us remember the value of steadfastness and communal work. May our message be heard and magnified. In intense crisis, let us long for the dawn! 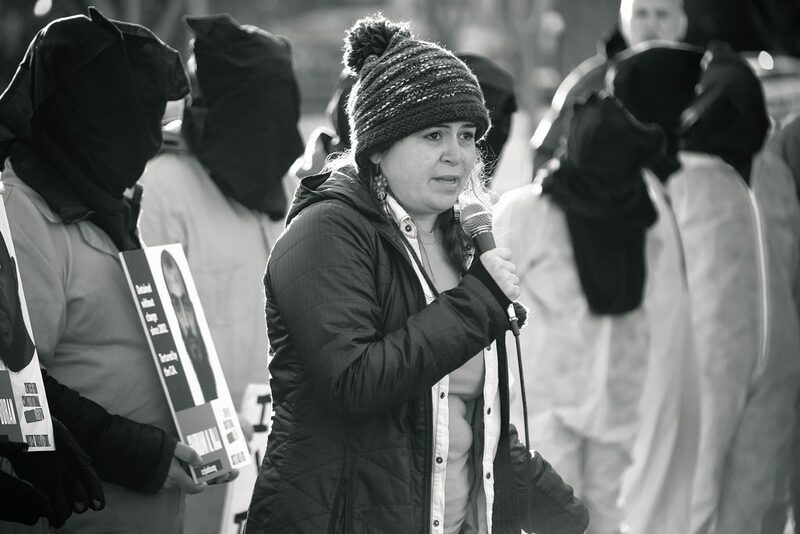 At out Witness against Torture Action Jan. 7 in front of the Pentagon, I felt so humbled and grateful to be standing for the 40 men still detained in Guantanamo. Though many of these men have been cleared for release or for trial the men still languish in conditions that are deplorable. President Trump refuses to even consider releasing anyone during his term of office. Every Monday a.m. The Dorothy Day Catholic Worker Community in D.C. stands in solidarity with all who suffer from U.S. militarism. Our Witness Against Torture group had the privilege of joining this faith-filled community for this freezing Monday morning. While singing, praying, and speaking on behalf of the men, I held the sign: “Is this who we are?” I felt the profound sadness and discouragement of these men who haven’t seen nor heard nor touched their spouse or child through many long years. It is this hope to be rejoined with their family that keeps them going, hoping for good people of conscience to give attention to these men’s unjust confinement. Please God, let it be. Good Morning. We greet all Pentagon workers and police in a spirit of peace and nonviolence. Since 1987 the Dorothy Day Catholic Worker has vigiled here each Monday to uphold God’s command “Thou shalt not kill” in nonviolent resistance to an empire that sanctions global violence and killing as evidenced by its vast war machine worldwide that included over 800 foreign military bases (including Guantanamo Bay), its military intervention in numerous countries, and its policy to prepare for and threaten to wage nuclear war. We, members of the DDCW and Witness Against Torture (WAT), come to the Pentagon, the center of warmaking on our planet, to say YES to love, justice and life and NO to the death-dealing policies of a warmaking empire. God calls us to love and never to torture, kill and wage war. 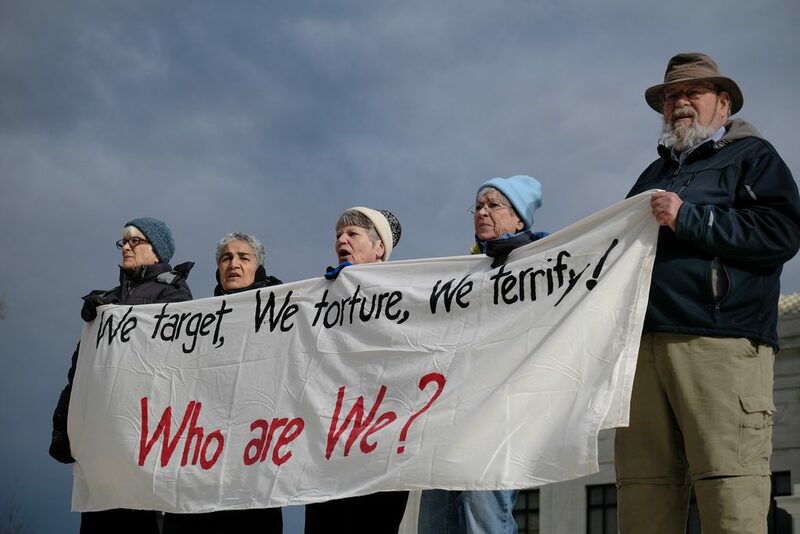 WAT formed in 2005 when 25 Catholic Workers and other peacemakers from the U.S. went to Guantánamo Bay Detention site and attempted to visit the detainees being held at the facility. For the last 13 years members of WAT have fasted and engaged in numerous nonviolent actions to call for the closing of Guantanamo. 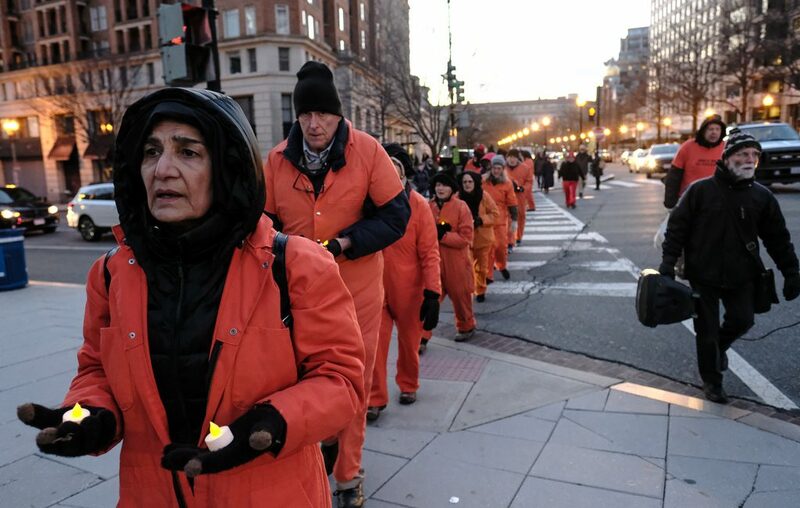 Today is the first day of WAT’s week-long “Fast for Justice” to mark the 17th year when the first detainees were taken to Guantanamo on January 11, 2002. We call for the immediate closing of Guantanamo, and for an end to the crime of torture and indefinite detention. 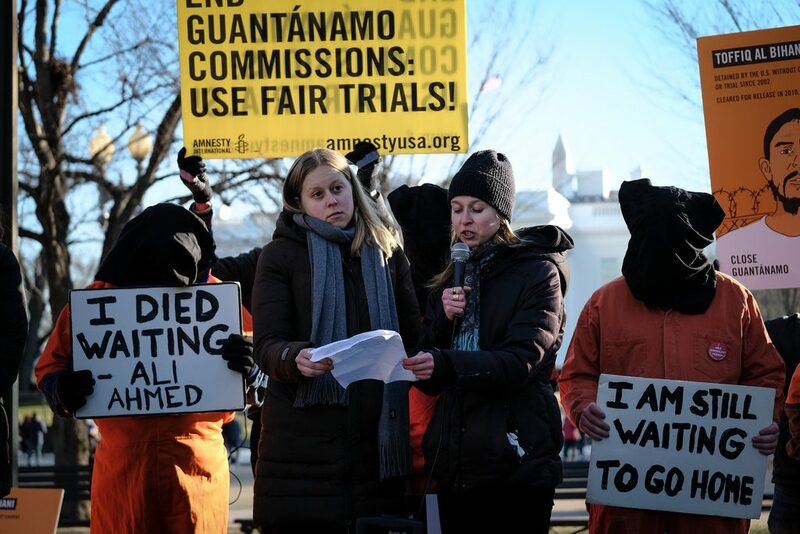 Refrain: End the Crime of Torture–Close Guantanamo Now! Today, 40 men continue to languish at Guantanamo, most for the last 16 years, never knowing their fate, with no resolution to their cases in sight. We need to see these men as members’ of our own blood family and act on their behalf. We remember and pray for all victims of the U.S. empire, including the 9 men who have died at Guantanamo since its opening. Adnan Latif was one of these men who have been all but forgotten. Latif, who spent more than ten years in Guantanamo without ever being charged with a crime, would often go on a hunger strike to protest his unjust confinement. A Yemeni citizen, poet, father and husband, Latif was subject to severe beatings, druggings and torture. He had been cleared for release at least four separate times yet continued to be imprisoned. On September 8, 2012, Latif was found dead in his cell. No independent investigation has been conducted into his death, or the deaths of the other eight detainees. 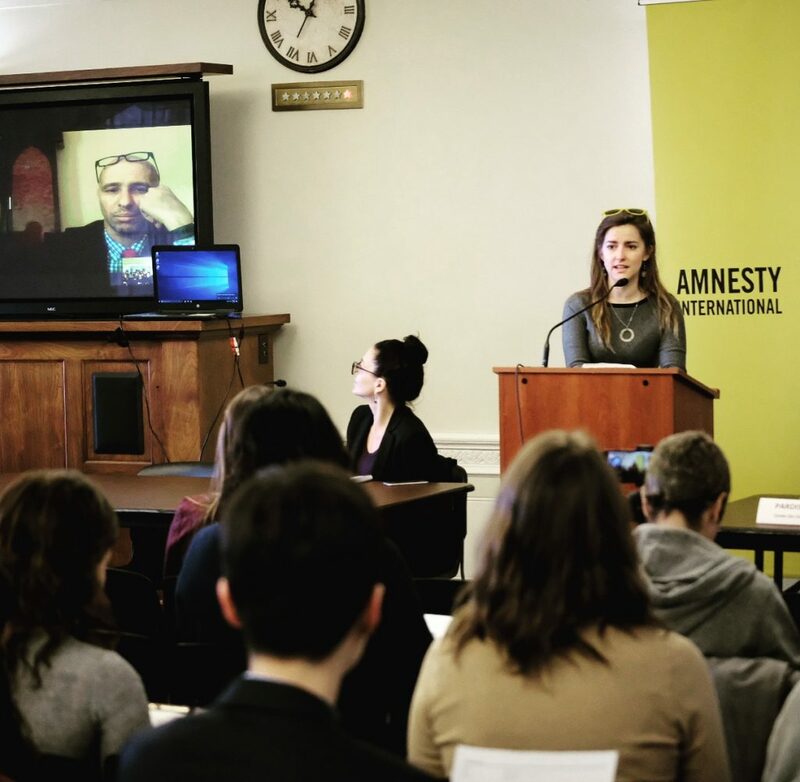 In Latif’s own words he asks: “Where is the world to save us from torture? Where is the world to save us from the fire and sadness? Where is the world to save the hunger strikers?” Adnan Latif: we and many others hear your cry and that is why we are here today! We call for an independent investigation into the death of Latif and those who died at Guantanamo! 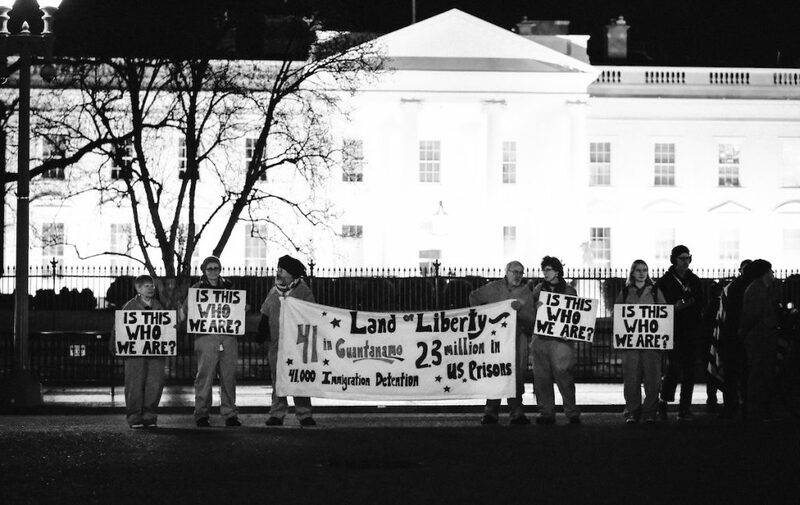 In the name of the detainees who continue to be unjustly held at Guantanamo, we call on all who work at the Pentagon to implore President Trump to issue an executive order to Close Guantanamo immediately! We also remember today all those who have died and continue to suffer from the brutal U.S.-backed Saudi war against the Houthi rebels in Yemen. The U.S. continues to provide direct military support and weapons to Saudi Arabia for this war, even though a recent Senate resolution called for an end to refueling Saudi warplanes, targeting and sharing intelligence. Thousands have died from the war, starvation is widespread and suspected cholera cases have exceeded one million. Save the Children conservatively estimates that 85,000 Yemeni children under age five have died from starvation and disease during the last three years. Refrain: The Children are Dying–End the War in Yemen! Since 2010, according to The New York Times, the United States has sold the Saudis thirty F-15 multirole jet fighters, eighty-four combat helicopters, 110 air-to-surface cruise missiles, and 20,000 precision guided bombs. Last year, the United States also sold the Saudis ten maritime helicopters in a $1.9 billion deal. A Lockheed Martin made bomb was used in the Saudi bombing of a school bus in Yemen on Aug. 9, 2018 killing 40 children. We demand an immediate end to this war! Please join us as we commit to ending, torture, oppression, racism, Islamophobia and war. Together let us heed the biblical mandate: “to proclaim liberty to the captives…to bring out the prisoners from the dungeon and from the prison those who sit in darkness” (Luke 4:18 and Is 42:7)…to beat swords into plowshares and to train for war no more.” (Isaiah 2:4, Micah 4:3) Now is the time to Close Guantanamo, end the war in Yemen and ALL wars, transform the Pentagon into a center that serves life instead of death, and to create the Beloved Community! 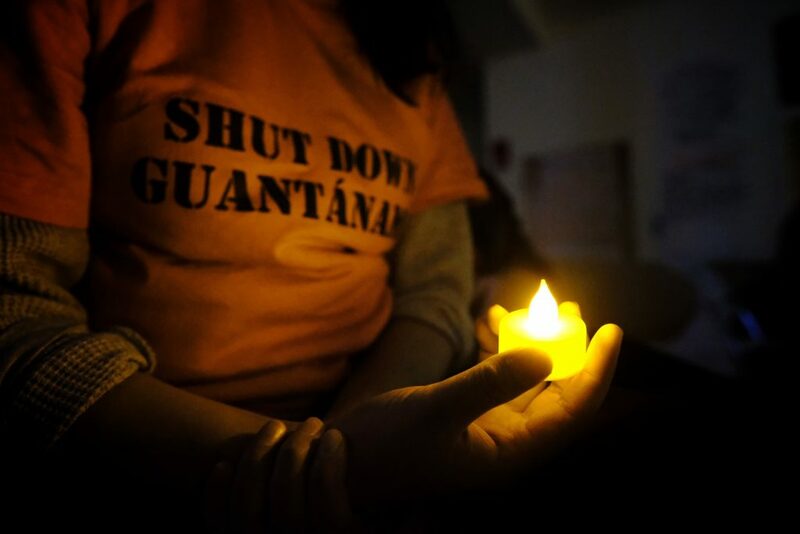 Our community is gathering this week in DC to mark another tragic year since the opening in 2002 of the U.S. detention camp at Guantanamo, where forty prisoners remain. Follow our daily updates this week on Facebook and our website. We would like to invite you to join us for Friday’s White House rally, a congressional briefing on Guantanamo, and Thursday’s speaker panel. Please read on for details. WASHINGTON, DC – On the 17th anniversary of the Guantánamo Bay detention camp, Witness Against Torture will be joining Amnesty International USA, the Center for Constitutional Rights, the National Religious Campaign Against Torture, Justice for Muslims Collective and others for a rally to demand the closure of the detention camp, end indefinite detention of the detainees, and condemn the fear-mongering, cruelty, racism and xenophobia that has defined Trump’s presidency. More than a decade after they were detained, 40 people remain at Guantánamo including five who have been approved by the U.S. government for transfer out of the detention camp. Most of the detainees have never been charged with or convicted of a crime. 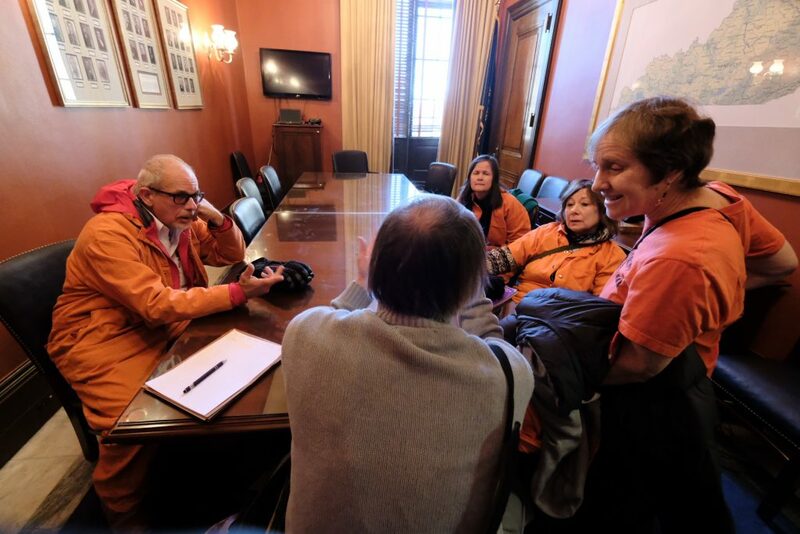 Please encourage your members of Congress to attend the Congressional briefing on Guantanamo to be held at 10:00 am, Friday, at Longworth House Office Building, Room 1539. From drones, to proxy wars, to CIA Black Sites, to Communication Management Units, Muslims domestically in the US and around the globe have continued to be targeted under the guise of the War on Terror seventeen years after its onset. 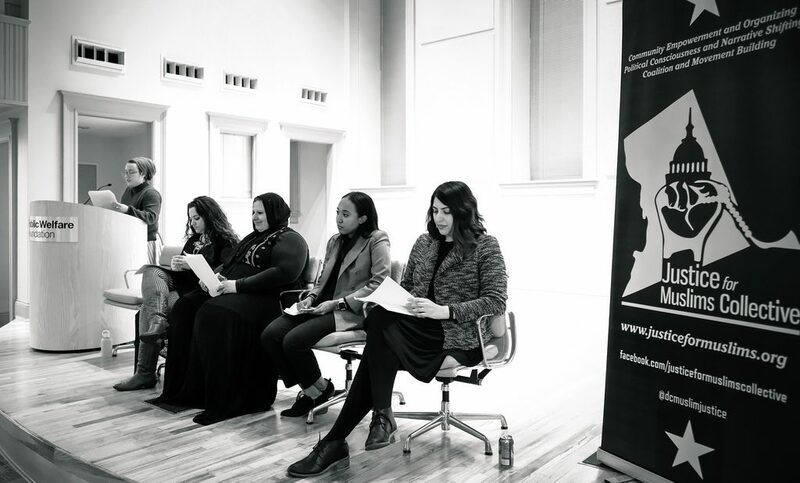 The panel will be moderated by Kristin Garrity Sekerci and will begin with a keynote from Dr. Maha Hilal (Justice for Muslims Collective), and followed by a panel featuring Darakshan Raja (Justice for Muslims Collective), Aliya Hussain (Center for Constitutional Rights), and Aya Saed (Center for Constitutional Rights) will speak to the impacts of the War on Terror on Muslims, both in it’s current manifestations under the Trump administration and it’s systemic nature, while addressing the role of institutionalized Islamophobia as part and parcel of the post 9/11 national security apparatus. Artwork painted by Guantanamo prisoners will also be on display. 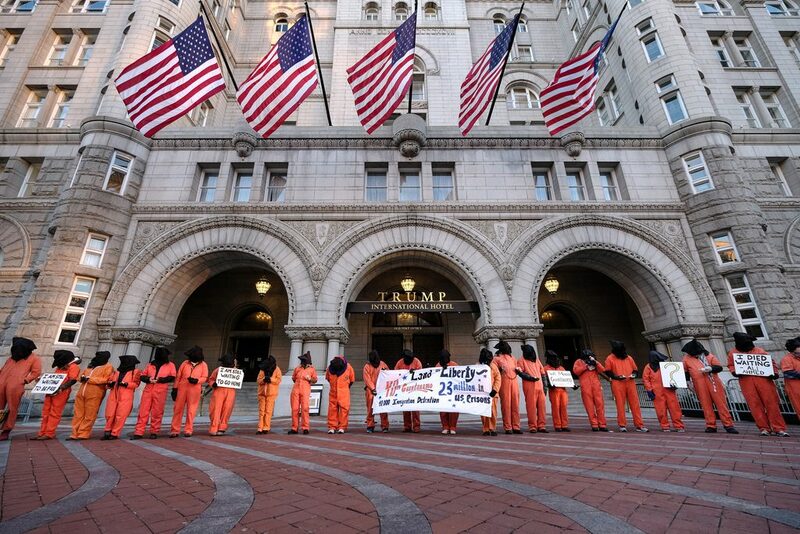 We’ll be gathering tomorrow in DC for Witness Against Torture’s week-long Fast for Justice. If you can’t join us in person, we invite you to join us from home, fasting with us in solidarity with the men in Guantanamo or taking action in other ways. We welcome you to join a conference call with us on Monday evening. This year, we will also be fasting in solidarity with the Kings Bay Plowshares 7(KBP7), our friends who are currently awaiting trial for their dramatic anti-nuclear weapon action at the Kings Bay nuclear submarine base in Georgia last April. Many of them have been deeply involved with our WAT community. In November’s KBP7 evidentiary hearings on their Religious Freedom Restoration Act motion, defendants presented testimony that can provide us with insights for WAT’s resistance to the prison at Guantanamo. Martha Hennessy opened the Nov. 19th hearing by recounting that her mother and her grandmother Dorothy Day taught her to pay attention to others’ suffering and to practice loving kindness. The KBP7’s concern for the death of billions in a large-scale nuclear conflagration is firmly rooted in their concern for the dignity of each person they meet in daily life. Similarly, we in WAT carry in our hearts and proclaim in the public square the personal stories of men who have been tortured and imprisoned without charge or trial at Guantanamo. Holding fast to the human dignity of each person unites our two causes to resist violence on every scale. Carmen Trotta told the court that the possession of nuclear weapons freezes nations in hatred. We must let go, he said, to become a cohesive community. Likewise, we in WAT recognize that we can never achieve true security for the family of nations while our own nation clings to torture chambers and offshore prisons. KBP7 members Mark Colville, Liz McAlister, Patrick O’Neill, Clare Grady, and Steve Kelly addressed the idolatry of nuclear weapons and the false sense of security these idols are meant to provide. This idolatry of things hugely powerful has a flip side: the dehumanization of the utterly powerless. The US attempts to make demons out of the 40 men still detained at Guantanamo, stoking citizens’ fear and then satisfying that fear with lawless brutality against these men. We fast to keep their humanity in front of our own eyes and the eyes of our nation. Let us fast–and act–together this week in the search for a solidarity that transforms. We invite you to join our fast next week wherever you are and in whatever way you choose. Let us know of your intentions by writing us at witnesstorture@gmail.com. We will hold a conference call with those who are fasting or taking action in solidarity with us on Monday evening at 8:00 pm. We will be sharing advocacy and action information and reflections on our website, our Facebook page, and through daily update emails to this list. We look forward to being in community with you, in person or in spirit, this coming week! 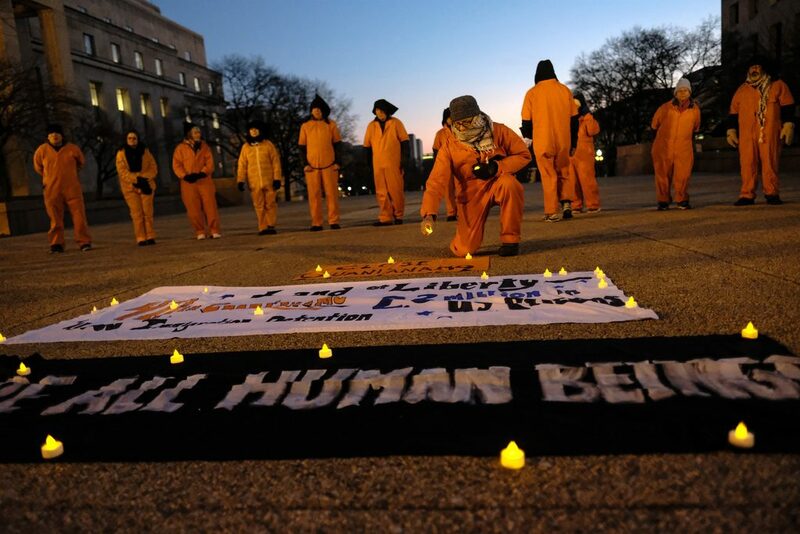 On January 11, human rights activists and attorneys will gather at the White House in Washington, D.C. to mark another tragic year since the opening in 2002 of the U.S. detention camp at Guantanamo, where forty prisoners remain. The demonstrators will call for the closure of the prison camp. Playing to Islamophobic fears of Muslim peoples, Guantanamo was founded with the lie that it houses only “the worst of the worst” terrorists. It continues to hold exclusively Muslim men, many of whom were severely tortured, without charge or trial. Other detained men face prosecution in the Military Commissions. The unworkable Commissions have failed to provide due process for the accused or justice for the victims of terrorism. Guantanamo has been a place of physical and psychological torture, the imprisonment of innocent men, brutal forced-feedings to break hunger-striking prisoners, and the pain of indefinite detention without charge. The prison remains a profound violation of law. It is a threat to American security and a blow to American ideals. It is an insult to the world, to the tenets of all religious faiths, and to the idea of human rights. Trump has put his own terrible stain on Guantanamo. Trump openly supports torture. Last year he appointed as CIA head Gina Haspel, who supervised a CIA torture “black site” in 2003. The Trump administration has ended the U.S. policy of seeking Guantanamo’s closure. Trump has threatened to bring new prisoners there. And he has forbidden the release of anyone from Guantanamo into freedom. This includes five men long cleared for release by the U.S. government itself. With no functioning mechanism for the release of any prisoner, Guantanamo has plunged deeper into lawlessness. Federal lawsuits are challenging this detention regime that deprives prisoners of nearly all rights of due process. The newly elected Congress and the American people must awaken to the persisting damage of this immoral and illegal prison and demand its closure. Guantanamo is now subject to the Rule of Trump. It feeds the fear-mongering, cruelty, racism, xenophobia and lawlessness of his presidency. Much of the world has been aghast at Trump’s defining policies and rhetoric: the Muslim travel ban; the separation of migrant families; physical and other assaults on asylum seekers; and the incessant slander of “foreigners” as threats to the American nation. Such cruelty and racism has always been part of Guantanamo. They now lie at the heart of vast domains of Trump’s policies. Images of Guantanamo detainees behind barbed-wire and in cages are echoed by those of migrants in detention camps. The hateful, fear-mongering rhetoric long used to denounce Muslim “terrorists” is now used to tar the people of whole nations and whole categories of immigrants. Now entering its seventeenth year, the prison at Guantanamo is newly dangerous in the hands of a bigoted authoritarian, contemptuous of the rule of law and human rights. We must work to establish the rule of law and respect for the rights and dignity of all peoples. We must close Guantanamo.